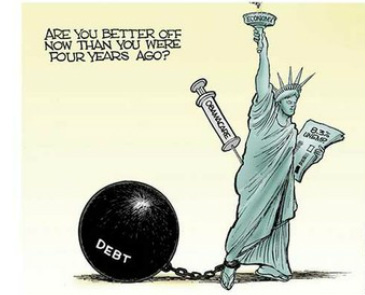 Any Liberal or Democrat who says the US is better off now than four years ago is either deliberately lying, deluded, insane, or any combination of the three. Let’s see, unemployment is the same or worse than it was four years ago. The Porkzilla stimulus was supposed to immediately reduce unemployment below 8%. After four years it has still not fallen below 8%. Much as he desperately wants the credit for it, Obama didn’t kill bin Laden. The SEALS did, using intelligence and anti-terror techniques developed under George Bush. Sure, I give Obama credit for issuing the order, but George Bush deserves just as much, if not more credit, for making it possible. Obama promised to cut the national debt in half in four years. Instead, it has tripled under his watch and does not show even one sign of slowing down. Obama promised to unite the country. Instead, with his partisan, near dictatorial ways, it is even more divided than before and growing more polarized every day. Obama promised the most ‘transparent’ administration in history, but everything he has done, from the closet shenanigans used to pass ObamaCare to the stonewalling and obfuscation of Fast and Furious, has been shrouded in secrecy and hidden from the public. This is not to even mention the millions of dollars he has spent in legal fees to hide and suppress his college, school, state legislature, and Senate records, as well as his long-form birth certificate and Connecticut-issue social security number. Defying Congress, the US Constitution, and US laws already on the books, Obama unilaterally gave amnesty to millions of illegal aliens, while millions more US citizens remain out of work, most due to Obama’s failed policies. Millions of human lives, not just in the US, but all over the world, were snuffed out without ever being given the chance at life, thanks in no small part to this administration and its support of abortion-on-demand with few or no restrictions. Who knows if one of those potential lives never allowed to be realized could’ve been the one to discover a cure for cancer? Or perfect a fusion reactor? Or lead mankind to the stars? The US has lost much of its standing in the world and is quickly becoming a laughingstock among both friends and enemies alike, under the weak leadership of the present Commander in Chief, who has been recorded on video bowing like a serf to foreign leaders instead of greeting them as an equal. Russia, China, Iran, Venezuela, etc., basically do whatever they want because they know under the current president, the US will do nothing to stop them. Our borders are even less secure than they were four years ago, both for illegal aliens committing crimes merely by sneaking into the country and for potential terrorists and Mexican narcotics gangs, something else the Obama administration does nothing about and would rather ignore, if not encourage. Our once proud military, once the greatest military force on the face of the earth, is continually being demoralized by Obama using it for experiments in social engineering. Soldiers’ rights are eroded even as the military budgets are cut, endangering morale, safety, and effectiveness. Both Social Security and Medicare remain on the verge of insolvency and Obama has done nothing about it, even when he and his party had control of both houses of Congress. Religious freedom, as guaranteed by our Constitution, is being eroded and, at the current pace, will soon be a thing of the past. Every day, conservatives and Christians come under increasing attack for our views with the active support and direction of the supposed Uniter in Chief, Obama, and his administration. We are disparaged, made fun of, and oppressed not only by the Leftist-controlled entertainment industry and news media, but by our own government that is supposed to protect us from such assaults on our freedoms and liberties. At the same time, the values that we oppose due to our religious beliefs are being forced upon us by the self-same oppressive media and federal government, whether we like it or not. Gasoline prices have more than doubled during the Obama presidency and are on the rise at this minute because of his failed energy policies. Higher fuel prices lead to higher prices for virtually all commodities, including food and other necessities of life. His administration has thrown away even more money on so-called ‘green’ energy companies that went bankrupt, wasting even more taxpayer dollars and driving up the deficit. Solyndra is just one of many failed ‘green’ initiatives from Obama and his minions with their failed energy policies. Hundreds of guns, including assault weapons, were allowed to walk, unchecked, across the border into Mexico under the direction and planning of the Obama administration, which promptly lost all track of them. Those guns were later used in dozens of murders, including those of US citizens and law enforcement officers. Iran is even closer to obtaining nuclear weapons than they were before Obama took office, obviously a danger to not only our only ally in the Middle East, Israel, but the US and Western Civilization in general. Obama has done absolutely nothing to stop them, except continue failed policies that have already proven that they will never, ever work. Despite his promises, peace is not only no closer in the Middle East, it is even farther away, thanks to Obama abandoning Israel and throwing his support to the Arabs and the Palestinians. The two wars in the Middle East were not won, they were given up on and surrendered, just like Vietnam, with exactly the same result. Soon Afghanistan will be exactly as it was before we went in – under control of the Taliban and a welcome home to anti-American, anti-Western, radical Muslim terrorists bent on either world conquest or world destruction. This is just a partial list; I could go on and on about how this country is falling apart and going to Hell in a handbasket under the current president. It might be better for you if you live in a good state with a proper government and leadership, like Texas, but where I live and in most of the rest of the country, it is absurd to think that things are better than they were four years ago. Prices for everything, including food and housing, but most importantly, gasoline, are rising while wages are stalled or falling and unemployment is either unchanged or getting worse. Our rights are being eroded by an ever-growing, more oppressive and intrusive government. The US Constitution and already enacted US laws are being not only ignored but blatantly defied, something you know a conservative president could never get away with due to the biased, partisan, Leftist mass media and press, while Obama gets a pass if it is even covered at all. Instead of being united, the country is being driven even farther apart and polarized, thanks to Obama’s Socialist (yes, that is exactly what they are) policies and dictatorial tendencies when he doesn’t get his way. If that is what you call better off, well, then I guess we are. But to me and a lot of other people, it is the absolute diametric opposite of better off. Four more years of this, and we will be dug in a hole so deep, we will never in a million years be able to dig ourselves out, even if George Washington, Abraham Lincoln, and Ronald Reagan all came back to life to help. Four more years of Obama? No thanks. We can’t afford it. Not if we want to stay the United States of America that we know and love.